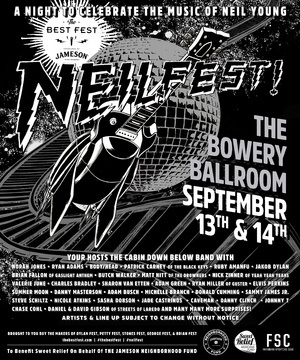 An impressive lineup of artists including Norah Jones, Michelle Branch, Ryan Adams and members of the Yeah Yeah Yeahs will team up for Best Fest’s Neil Fest on September 13-14 to support Sweet Relief—a non-profit dedicated to financially assisting musicians in need of emergency help. The benefit concert, taking place in New York City’s Bowery Ballroom, will be a tribute to legendary rock musician Neil Young. Each artist will play their favorite Young tracks in a two-night extravaganza paying homage to one of rock’s most influential figures. This event follows in the footsteps of other Best Fest benefit concerts such as Petty Fest, which was a tribute to Tom Petty, and Stones Fest —a tribute to The Rolling Stones. Ticket proceeds will go to Sweet Relief on behalf of the Jameson Neighborhood Fund, which raises money for a multitude of charities that provide education and resources to bartenders, musicians and others. Sweet Relief is also focused on assisting elderly musicians who have little or no resources or funds available in case of emergency, or when illness strikes. According to Sweet Relief, more than 65% of professional musicians do not have health insurance, and the average income of career musicians is less than $25,000 annually. Sweet Relief founder and singer-songwriter Victoria Williams toured with Young in 1993, but was forced to cut the tour short after being stricken with multiple sclerosis. After her diagnosis, a group of friends put together an all-star album of Victoria’s songs, Sweet Relief, which helped cover her medical debt. Williams, knowing that there are many musicians like her who are unable to afford medical treatment, donated proceeds from the album to found the Sweet Relief Musicians Fund. To purchase tickets to Neil Fest, click here. To learn more about Sweet Relief, or donate to help musicians in need, click here.